I received the Catalyst Soft Shell Glove (link here) in September 2018 as a *prototype, before it even had a name. The crew at First Lite described it as a mid-season lightweight glove well suited for hunting and even working around camp. They wanted me to use it on some mid-fall hunts before their planned release of the glove in 2019. 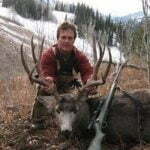 I had a backcountry buck hunt planned the following week, so the timing was perfect. 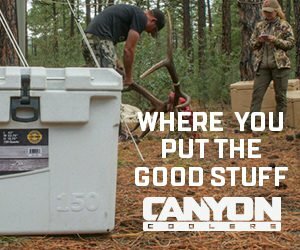 As a long-time First Lite user, I was excited to see if the Catalyst Soft Shell Glove would make my gear list. To note, I used First Lite’s sizing chart to peg me at a size Large. I found this method accurate as my gloves fit just right. I first wore the glove around my place for morning chores. Temperatures were near the freezing mark. I found the articulated fingers let me do even some finer work like unfolding my pocket knife or separating a key on a key ring. First Lite said the glove has a DWR coating and water-resistant liner. I found they shed the dew and frost well enough, but when subjected to touching really wet items, they did soak through. I’d expect a glove suitable for activity to be more breathable than waterproof anyway. The design includes First Lite’s exclusive 37.5 Active Particle Technology in a fleece interior to help move moisture away from the skin. I found that this worked to maintain better heat retention and reduce clamminess. After several mornings of the home testing, I was comfortable enough to trust the glove for my upcoming buck hunt. On the morning of October 8th, just as a week-long snowstorm was setting in, I left the trailhead. A 14-mile horseback ride in near freezing temps lie ahead. As I’d be very inactive, I elected to run the heavier and more insulated First Lite Alpine Glove (review here)for the ride. Once at camp, I donned the lighter gloves and went to work. By dark, I had my Seek Outside 8-man Tipi complete with their Titanium stove set up, alongside a nice pile of firewood I had gathered and split. I had also built a saddle rack and set the horses to their picket lines, all while wearing the glove. Back in the tent with a fire roaring, I pulled the gloves. Even with all that effort, I found the insides fairly dry. The outsides looked damp, but were far from soaked. The webbing loop on the middle fingers allowed for the glove to be hung upright with the open cuff down. This better gathers heat from the fire. I found this feature was a handy addition and worked very well to dry the gloves. 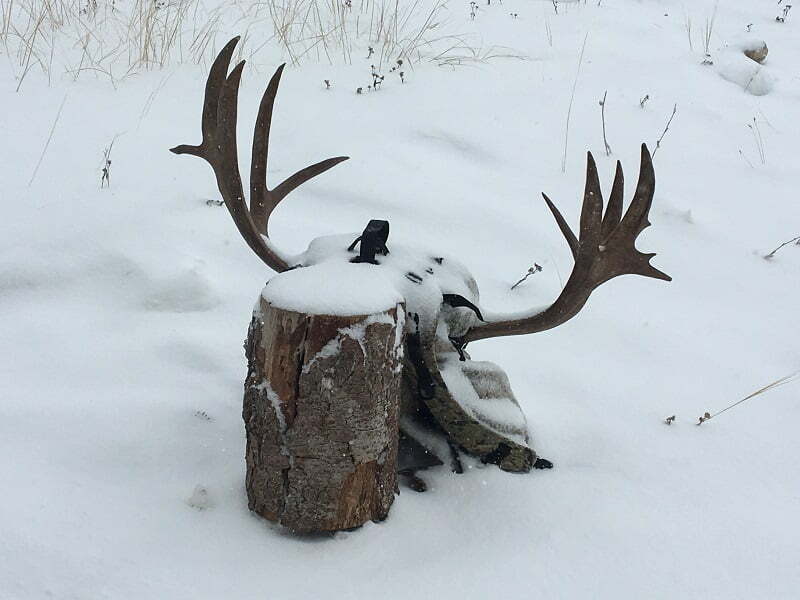 I hunted the next five days in intermittent snowstorms with temps between 20 and 30 degrees F. The Catalyst Soft Shell Gloves were good for active hunting in those temps. When I’d stop for long, I’d have to put my hands in my front pockets of my Uncompahgre Jacket or my Obsidian Pants or donn my Alpine Cold Weather glove. With their slender and light design, they fit well into the pockets. I found I was even able to feed cartridges into my rifle’s magazine with the gloves on–nice! 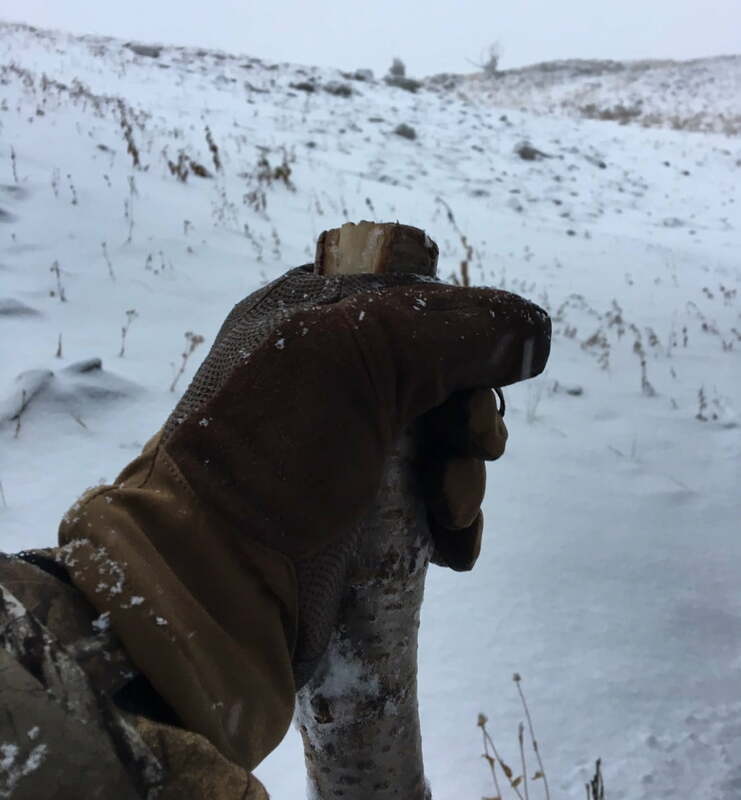 On the 5th day, the storm broke and temperatures plummeted into the low teens for the morning hunt. That was the bottom end of the glove’s capability and I had to put my hands in my pockets or switch to the Alpines a lot. Later that morning, I killed a good buck after an hour stalk and a long wait for him to clear the cover. I was able to shoot with the Catalyst gloves on. That sealed the deal for me right there. 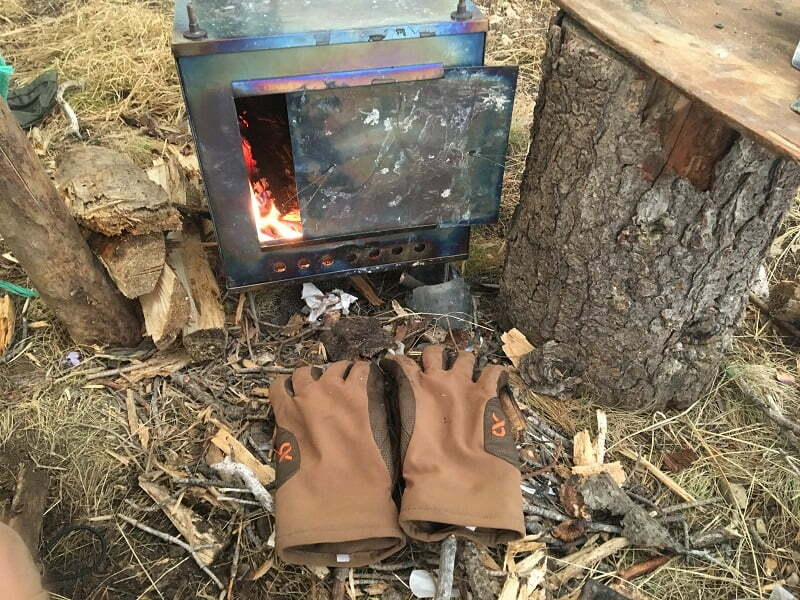 Gathering firewood is hard on gloves, but even after a week in camp, I’d ripped no holes in the Catalyst Soft Shell Gloves. 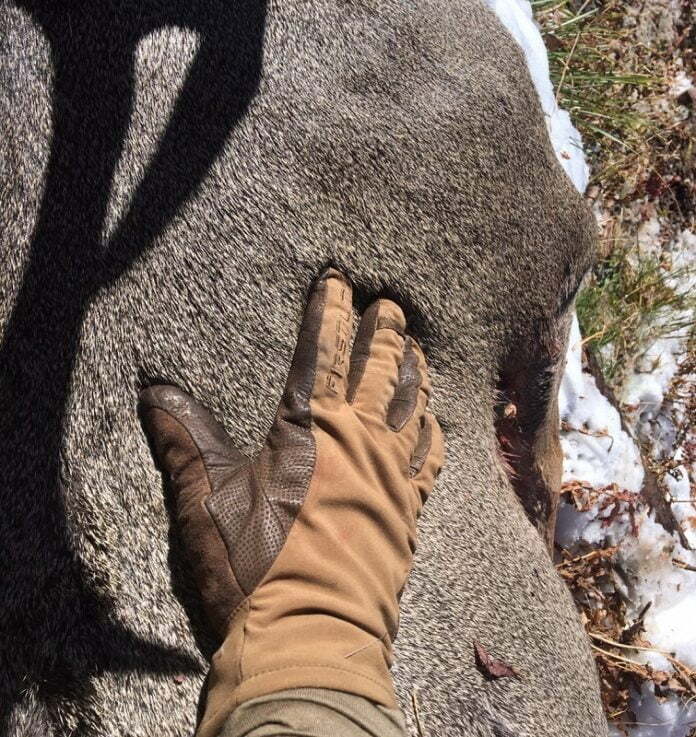 I continued to wear the gloves into November on various hunts. 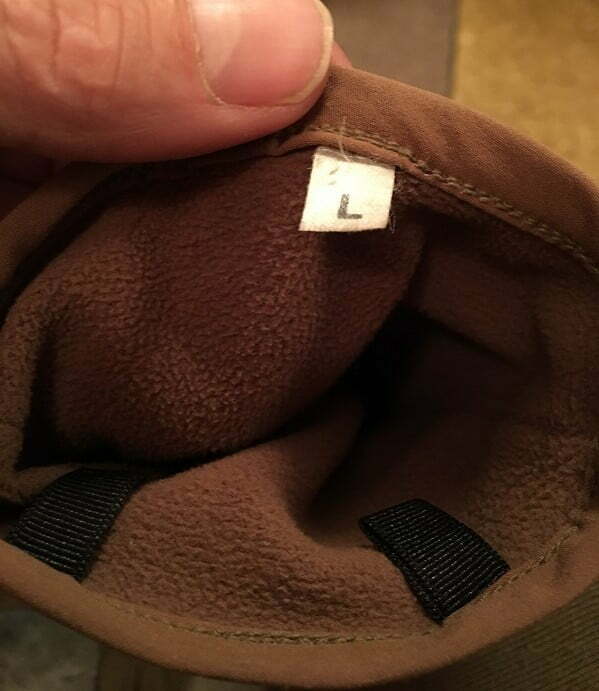 Just like the October hunt, I found them good for active hunting down into the teens, as long as I had pockets generous enough to fit them into. I did soak them a few times in heavy rain and wet snow, but found them easy enough to dry with a heat source. They are not touch screen capable so you will have to remove them to operate a GPS or smart phone. I found the side release wrist clips handy for keeping the gloves together in a pack or dufflebag. The suede thumb nose wipe was also very usable. At the $70-$80 price tag, I think the Catalyst Soft Shell Gloves (link here) are a good value for an active hunter also needing a camp glove suitable for light to medium duty work.